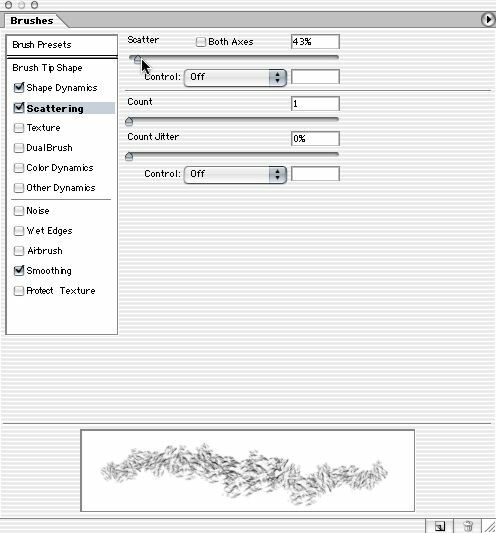 Ok, here's a quick tutorial on building custom organic brushes..
All files have been posted at actual size in case you wish to download them for scale comparison with what you do at home. First off, you'll need a good organic greycale source image. I'll usually start off by scanning something in, running various fractal filters, or just making compicated selections and painting into them. 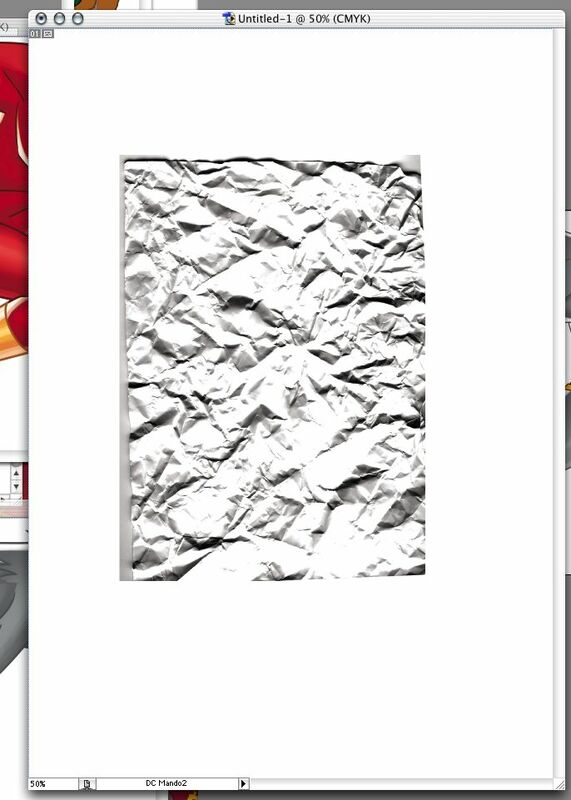 For the purposes of this example I just downloaded a paper image off the net. You want the image fairly big. 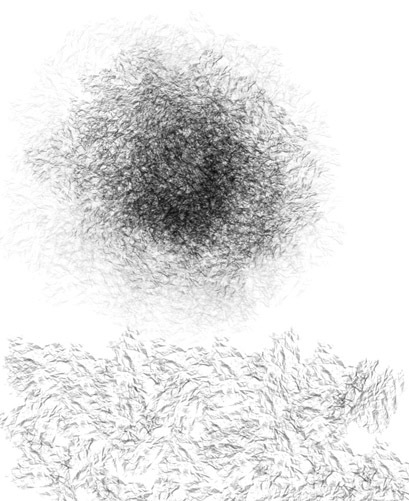 You can scale brushes down easily, but they begin to lose clarity when you scale them up, so I like to keep my brushes of this type in the 500-1000 pixel diameter range. Notice the very high contrast. This is essential for a good looking brush, as you can always lower the brush's contrast behavior, but never increase it. So, start at the highest contrast possible, or you may come to regret it later. I used a lasso with a good feather on it to carve away at the source image until I was happy with the shape. I will often use the brush tool with a lot of feather at this point as well, to get the look I want. Try to keep it more or less symmetrical in your early brushes, until you have a good understanding of the potential controls. Be sure not to leave any " orphan points" that stand out too much, as you will begin to recognize them as a pattern in a brush's sweep, and ruin the natural effect. Also, make sure that the area surrounding your final brush shape is 100% white. 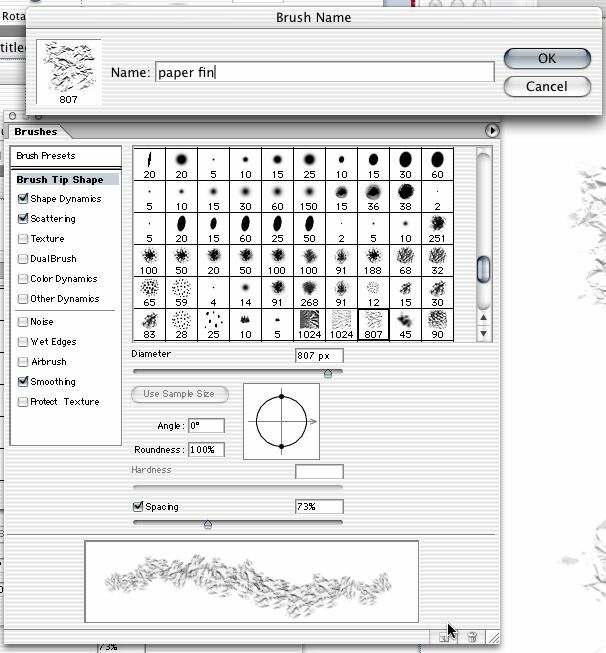 This is essential, because now we are going to select an area around your brush shape and "define" it. Any grey information would be saved into the brush, and the edges of your selection would show up as a noticeable ghosted line. 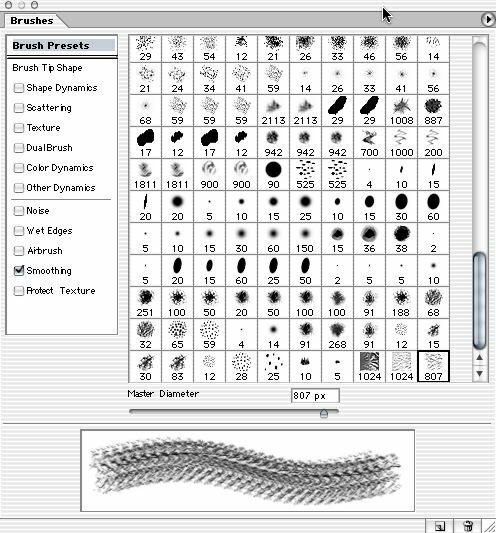 Once your brush is defined, you need to fine tune the way it will function in order to randomize it and make is seem natural, seamless, and unpatterned. As you can see in the above illustration, when first defined, a brush looks fairly unnatural. The first thing I usually do is increase the spacing until I am happy with the density. 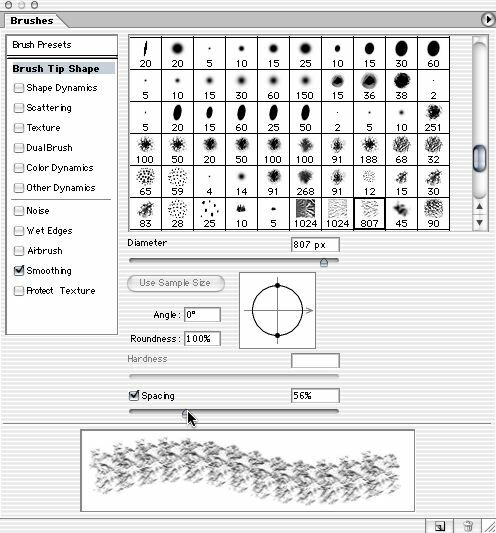 Then I will add some size and angle jitter to begin randomizing it's behavior, and adjust the minimum diameter to an amount appropriate for the type of brush I am building. In this case, I want to maintain the crinkly look and feel, so I set it quite high. Next I added a bit of scattering, to mix things up a bit. This is a good touch when you plan to use a brush for coverage, as it will prevent the brush from leaving a definite path as you move it back and forth across the page. If you space your strokes carefully, you can usually use a brush like this without any visible trails. Now after I adjusted the spacing a bit more, I saved the brush by clicking the "new" icon indicated by the cursor. You will end up with two brushes using this method. Your working one, and this final one. I like to have both in case I want to go back and tweak without affecting my newer "master" brush. Here is the brush I built at work. The top one is built up sweeps at increasing opacity settings. The bottom row is the brush passed twice, in horizontal strokes. I may go back in and add another version of the same brush with various opacity and flow options at a later date, and I will definitely have a link to download it, so you guys can play with it and see it at work. Last edited by Zombie Dave McCaig on Mon Jul 18, 2005 6:46 pm, edited 6 times in total. I seriously need to upgrade to PS7. Scott Johnson wrote: I seriously need to upgrade to PS7. 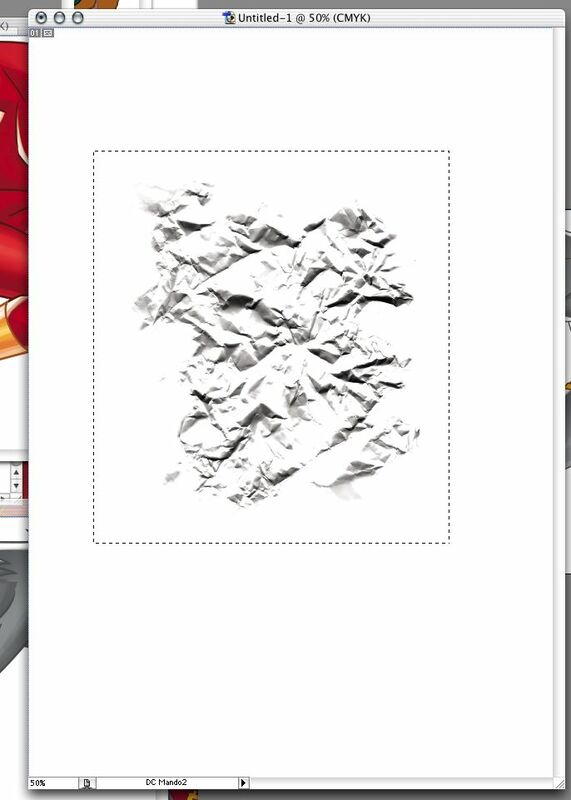 i still am on 5.5, but use 7 for backgrounds and texture creating sometimes. still 5.5 has pretty much everything i need. i was still running 3.05 until 2 1/2 years ago. I just bought 7 this week. Boo. I crashed and lost this brush...I'll have to make it over again. What's that about a crash mac master? What the hell is my avatar DOING? actually, I pulled the f** powerplug out by accident, and turned my system off..."Crash" sounded less boneheaded tho. That's about as close as I can get to a crash these days. Pulling out the powerplug wasn't the boneheaded part - Not saving the Brush Set... that was boneheaded. 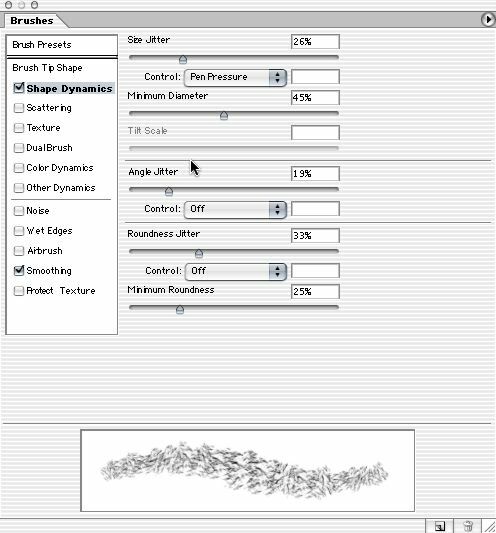 Good tutorial, but you should add to it that until you've actually saved the Brush Set, you can still lose those nifty brush(es) you spent all that time creating.